Christ Church (also known as Kirton Holme Church) is an Anglican Church located in the small village of Kirton Holme which is located on the outskirts of Boston, Lincolnshire. The church has been the focal point of the village since July 1964, there was religious activity in the village prior to this in the form of the Methodist Chutch. Kirton Holme Church is proud of its history which stretches back over the last two centuries. The earliest record of religion in Kirton Holme and Hubberts Bridge starts at the beginning of the 19th century. There were two groups the Wesleyans and the Anglicans. The first chapel for public worship at Kirton Holme was built by the Wesleyans in 1820. The Anglicans met at “Kirton Holme House” initially, and then in 1865 the Lord Bishop of Lincoln made it known that an Anglican church should be built to serve the two hamlets of Kirton Holme and Hubberts Bridge but it met with little response from the local clergy. Subsequently a barn was offered free of charge at Bridge Farm, Kirton Holme but Reverend Ludllow, the Vicar of Kirton objected to the granting of a licence for a priest to hold services. A licence was granted by Reverend Tunnard, the Vicar of Frampton who refused to accept responsibility for the services though. Reverend Canon Blenkin, the Vicar of Boston accepted the care of the district and provided the necessary staff. In 1872 a small mission room was built as a temporary measure in Frampton parish by the side of the main road known as “The Ramper”. This was the first Anglican Church. Following the death of the Vicar of Boston the responsibility for Kirton Holme and Hubberts Bridge parish passed to Reverend W Heap, the Vicar of Brothertoft. 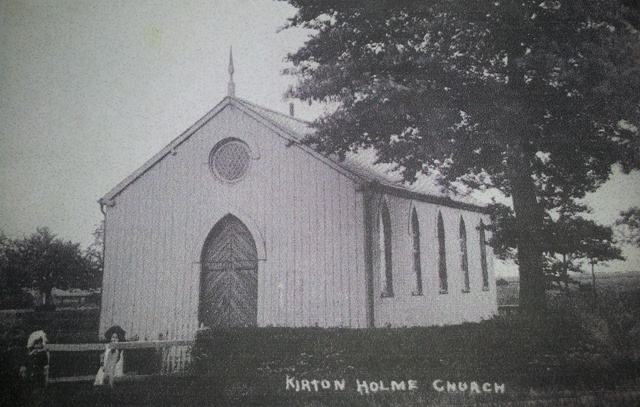 Then in 1909 Reverend Palmer, the Vicar of Kirton took over the pastoral care of Kirton Holme leaving Hubberts Bridge to look after itself where in 1871 a primitive Methodist chapel had been built so the Anglicans and Methodists worked side by side. In 1916 the Vicar of Kirton resigned the living and the situation deteriorated until two lay readers from Boston took responsibility for the services at Kirton Holme. In 1921 Kirton Holme and Hubberts Bridge where included in the ecclesiastical parish of Brothertoft. This is when plans were made to build a permanent church, but every enquiry made for a suitable site proved fruitless. After being closed for two years the mission-room at Kirton Holme was reopened on Sunday 28th November 1960 for Sunday services – Holy Eucharist at 9:30am and Family service at 3pm. This was well attended by parishioners from Kirton Holme and Hubberts Bridge. In 1962 the Methodist Chapel at Kirton Holme was closed down and the chapel and the schoolroom was offered to the Anglican Church and subsequently purchased for £800. Reconstruction started on the building in 1964, until finally on Wednesday 15th July 1964 “Christ Church Kirton Holme” was opened and dedicated by the lord Bishop of Lincoln The Right Rev Kenneth Riches, thirty four years after the first real effort was made to build a permanent church. The whole process took just under 100 years to complete. Subsequently the church is rededicated each year in July. Christ Church will celebrate fifty years in 2014. Kirton Holme has a population of c600 and is a part of the Kirton parish district. In the past Kirton Holme had a bus service call Holmes Delight Bus Service, this ran every hour between Spalding to Boston. Although this service is now provided by Kimes it has lost the romanticism of earlier days. If you are interested in revisiting the past one of the buses used on the route is now part of the Lincolnshire Bus Museum Collection.